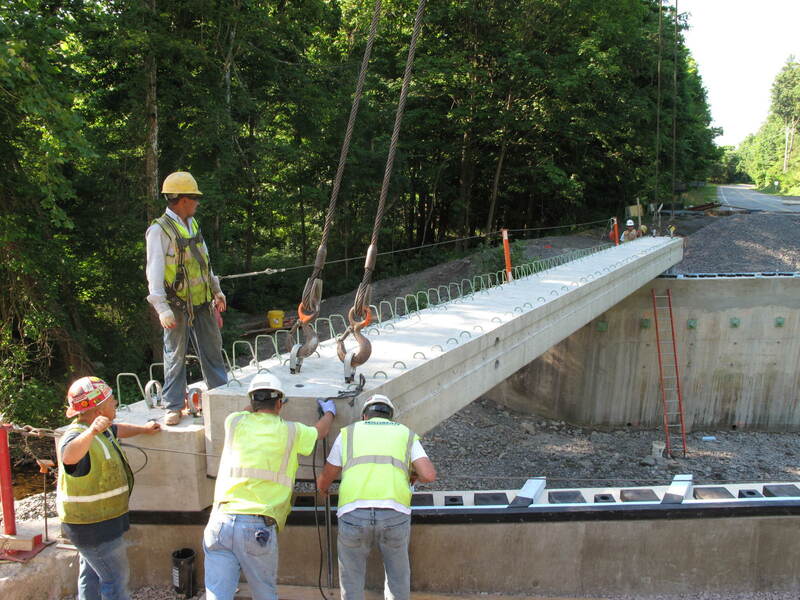 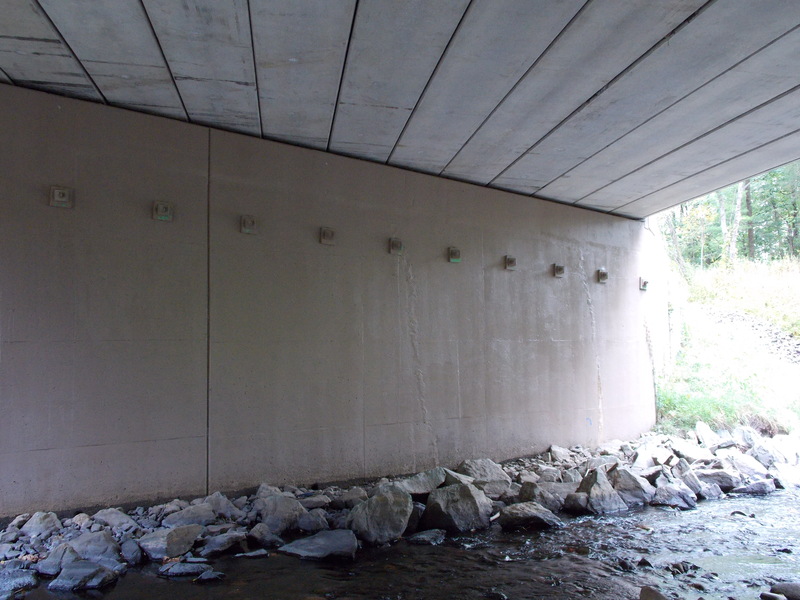 Structural engineers applied a cost-efficient method of rehabilitating and strengthening concrete gravity wall bridge abutments, avoiding complete structural replacement in an environmentally-sensitive national recreation area. JMT was part of a design-build team tasked with the superstructure replacement and substructure rehabilitation and strengthening design/construction for a deteriorating, structurally-deficient bridge spanning over the Raymondskill Creek in the scenic Delaware Water Gap National Recreation Area, Pike County, PA. The single-span bridge, constructed in 1955, is owned by the National Park Service (NPS) and carries US 209 traffic over the creek. 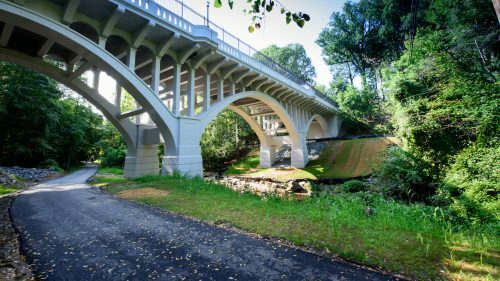 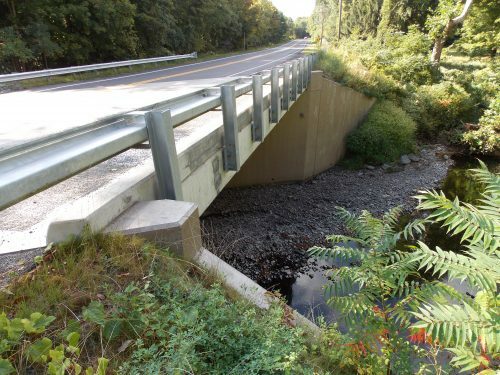 A complete structural replacement for the aging bridge would be more costly and time consuming than rehabilitation, and the project would require new environmental permitting activities if the abutments were completely replaced. The team was challenged with determining the most efficient, cost-effective way of stabilizing and strengthening the existing concrete abutments, which had started to show signs of deterioration and settlement. 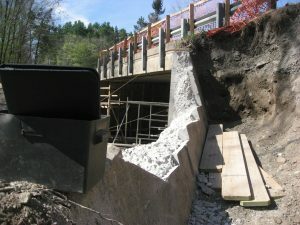 Due to structural stability concerns, it was crucial the stabilization and strengthening occurred prior to removing the existing superstructure. After investigating various alternatives, including soil nail reinforcement, ground anchors, and jet grouting below the foundation, the implemented system consisted of drilled-in micropiles extending from the top of abutment down to bedrock to resist vertical loading, and a deadman anchor system installed behind the abutment walls to resist horizontal loading. With the successful installation, the abutments were stabilized against further movement and rotation due to settlement, and were strengthened to resist proposed loadings from the newly-constructed bridge superstructure. Scour protection measures at the bridge were placed to mimic the existing streambed morphological features and promote long-term stability to the creek, a high-quality cold water fishery and natural trout reproduction stream. It was essential to protect the region’s natural and cultural resources during construction. 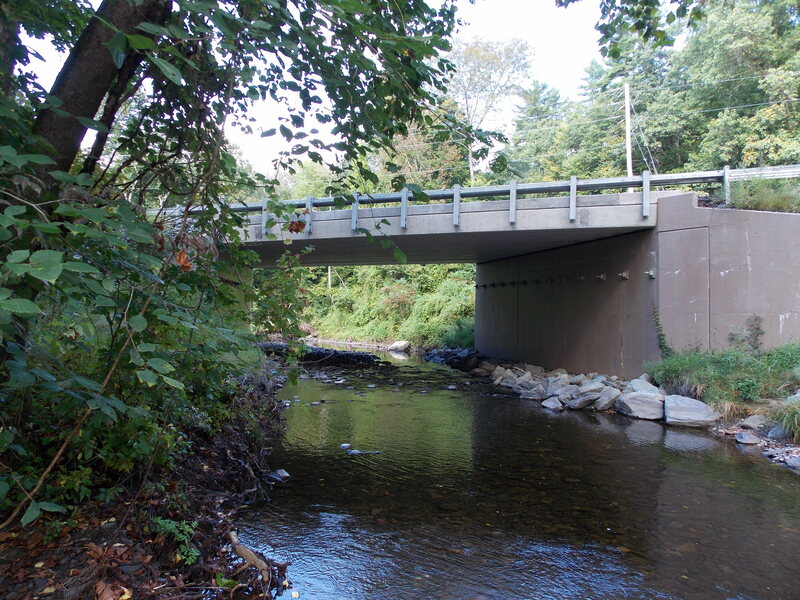 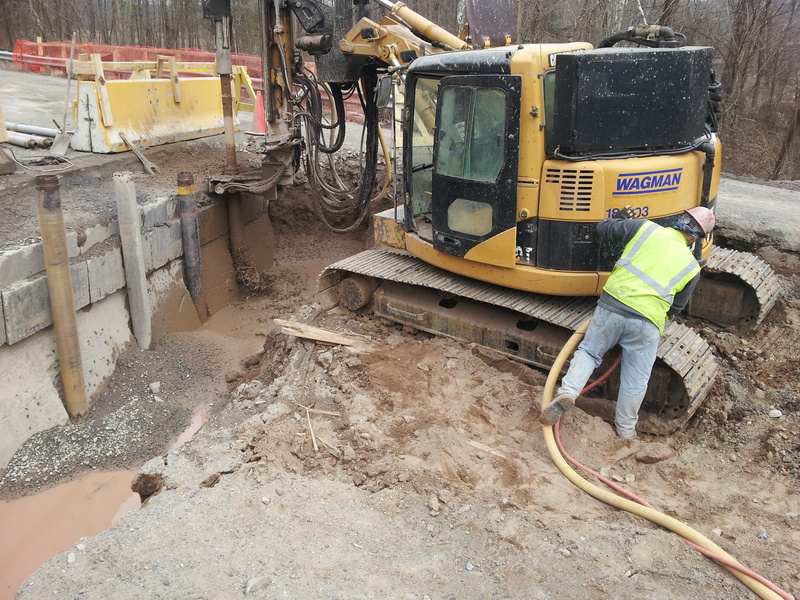 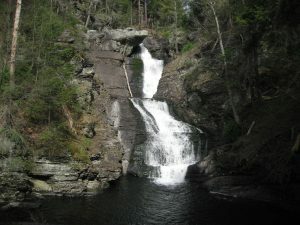 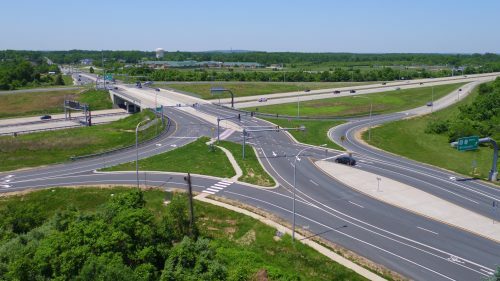 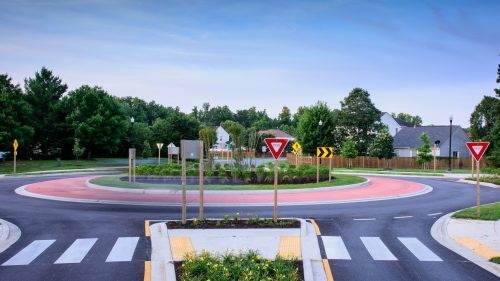 Through collaboration with the NPS and Eastern Federal Lands Highway Division, this mission was accomplished by minimizing impacts necessary to complete the construction, thereby limiting impacts to Raymondskill Creek and the surrounding lands. Rocks required for scour protection were covered with a combination of native streambed material, soil and/or vegetation to provide an aesthetically pleasing area around the finished structure that blended in with the natural surroundings. 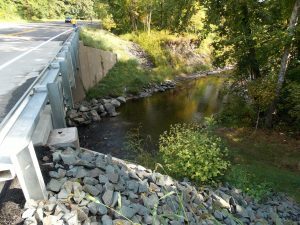 Any vegetation disturbed during construction was replaced with a native plant species approved by the NPS and the Pike County Conservation District.